Okay, so some habits are definitely hard to break. I was trying to plan on the weekend what I would need for Thanksgiving so that I wouldn't have to go to the store on Tuesday or Wednesday of Thanksgiving week. It actually took me a couple days to realize that the stores would not be any more crowded than usual on Tuesday or Wednesday. In fact, the only Thanksgiving hype was my own stress I was creating. We would not have had all the ingredients we needed if it had not been for my friend who went to the Military base and picked up some things for us. It was turning out to be a busy week as usual. Monday, after school, we had a dance rehearsal for Bailey and Olivia who decided it would be fun to do a dance for the talent show on Dec. 4th. I tried to tell the girls that music has a certain pattern and when you choreograph a dance, it is good to use the pattern in the music to find where you should repeat certain steps (especially when your seven years old and you only have a couple weeks). We started at 3:30pm and we ended at nearly 6:00pm. It was very frustrating to me as I was trying to get them to narrow down their ideas and get something finalized on paper: which steps they wanted to do to which parts of the music. Truly I thought this will be a disaster. But, I must say (we had another rehearsal since last Monday) and it really looks cute. We got home later and had a Breakfast dinner because I'm pretty sure that was all we had available as far as food goes. Tuesday was a busy day of shopping and trying to prepare everything that we would need to have for our Thanksgiving dinner. 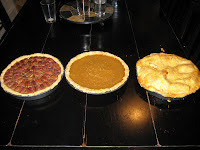 Wednesday, I took the girls to school and spent the rest of the day making pie crusts and pies. Avery was quite helpful with the rolling out of the pie crusts when she got home from school. 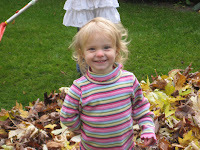 When we went to pick up Bailey from school, her teacher ran out and said, "I don't think Bailey is feeling so good." When I took one look at her, I knew she was sick. Her eyes were all dark and she looked so pale. We went home and she rested on the bathroom floor. It was the flu. Poor thing. She pretty much spent all of Thanksgiving day laying in that same position. Greg took Thursday and Friday off so we could use the time while the girls were in school, one to make Thanksgiving dinner, and two to do some Christmas shopping. Thursday morning hit and we were running. I took Avery to school while Greg made the third pie and prepped the turkey. Avery apparently had a Thanksgiving feast at school of Pasta, where she won the eating contest and had three bowls of pasta. Yes, Avery. I thought that was pretty ironic considering that one of my many jobs is trying to get calories into that kid as much as possible. 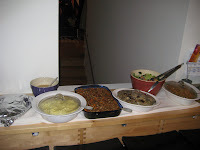 We spent all day cooking and we ate our spread in about twenty minutes. I have much more empathy for my mom and mother-in-law and all the hard work that goes into feasting on this day; one that I have always taken for granted. Bailey was able to get up and try to eat a little bit before dinner was over. We saved her a piece of the apple pie as she was the one who insisted on Apple for Thanksgiving. I could not deny my daughter apple pie as I had always been privileged to have apple pie as long as I can remember on Thanksgiving. Everything was pretty good and worth the effort. The kids watched Charlie Brown Thanksgiving and the Mayflower that evening while Greg watched the Lions game. Saturday, of course, we had to go back. 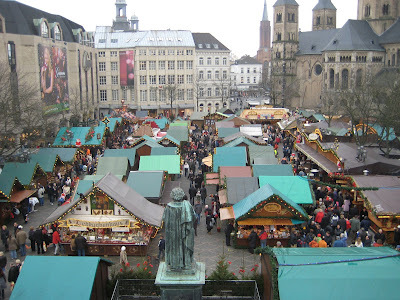 We hadn't seen the whole markt and the two older girls hadn't seen it at all. We went on the Ferris wheel and that was really fun, although we noticed we were the only ones that were being quite loud with our, "Wees and Oohs." 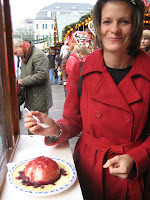 We took in some Dampfnudeln mit vanille sose und kirche (a pasta ball with vanilla sauce and cherries) and Poffertjes which were like mini pancakes in a waffle bowl with cherries. Really good. I wanted to get something with more sustenance but we settled for hot chocolate and steamed milk. It was fairly chilly so we took some time off and went to Puppenkonig again to hopefully get some ideas, which we did get a few ideas. There was a small ice rink set up in the middle of the Christmas market which I would not let Bailey skate on, as she had no mittens or hat, and she was wearing a skirt. She was slightly bent out of shape which made walking around in the cold with bitter children not so much fun anymore, so we left. On the way home, we picked out our Christmas tree. You have to go to a tree farm here, and reserve your tree. We found the trees to be quite reasonable in price compared to the US. Then, typically the Germans go back and pick it up on Christmas Eve and set everything up on that day. We will probably pick ours up a little sooner than Christmas Eve. We relaxed for the rest of the day. We all needed a few hours to rest. Sunday was pretty normal...Church, then video conference, then hang out together. Greg and I spent the evening trying to brainstorm ideas of what to do and where to go while my family is here visiting after Christmas. By the way, for all those Detroiters that hopefully read this...there are awesome fares from Detroit to Dusseldorf right now but you have to purchase by today 11/27/2007. On Monday morning after dropping the girls off at school, I picked up the drivers licenses as promised without issue. I think we are starting to get the hang of this Germany thing. I was scared to do this by myself but managed through it with my best German. Bryn and I went home to try and get the enormous piles of laundry started so the girls will have some school clothes to wear this week. And, I had to cram in my German homework once again before my lesson. After school, we had to stop at the bakery and get Weckmanner. 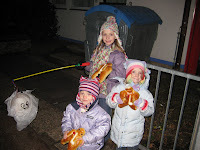 It was St. Martin's Day on Sunday but Bailey and Avery's school was celebrating it on Monday evening. We apparently had to have the weckmanner for this occasion. It was a bread man with a white pipe. I'm not sure of the significance of this but everyone seemed to enjoy it. St. Martin lived in the 4th Century A.D., in France, and was in his youth a soldier in the Roman Army. One day while out riding, he saw a beggar, this was not an unusual sight for these times. The beggar asked Martin for some food and warmth, and Martin suddenly realized how unfair it was that he should be wearing a warm cloak while this beggar was freezing. So, he stopped, got off his horse and cut his cloak in two giving half of his cloak to the beggar. The following night Jesus appeared to Martin in a dream. After this encounter, Martin decided to lead a religious life as a Christian Missionary. In the year 371, Martin was elected "Bishop of Tours." He did not feel worthy of this honor so he hid himself from the people in a shed with geese. The geese start gabbling so loud that they gave his hiding place away. He was then made Bishop of Tours. When Martin died on November 11, 397, he was hailed a Saint because of his humility . In remembrance of his good deeds, the traditional meal on November 11th, is goose. However, we had something else. The rest of the week, I was fighting off a sore throat so I really tried to avoid anything we didn't absolutely have to do. 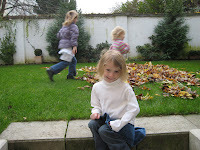 Avery had a play date with her friend Ava on Friday after school which was really nice for them I think. Saturday, we had planned on going to the market downtown but after several meltdowns, we decided to skip the market. The girls and Greg did some yard work. That evening we went to Koln to one of Greg's friends from work. He got the Michigan/Ohio State Game on his TV so a bunch of us went over to watch it. It was quite late when we got home, and Greg was a bit disappointed in the outcome. Sunday, we went to Church. I had my first Stake Relief Society meeting in German. And, Greg had his first baptism that he had to conduct in German. Greg did a great job, I was told by one of the members of the bishopric. I, on the other hand, had a difficult time understanding what was being said. I guess we can only get better with our German from here but sometimes it seems that the progress is slow or even regressing. It was once again a week with quite a bit packed into it. First, we ordered a new computer and it had gone to the customs office so Monday I asked my German teacher to call the office and find out what I had to do to pick it up. I didn't have enough time to get it on Monday after picking Bailey up from school and getting across the Rhein by 3:30pm. So, that was the Tuesday morning plan. However, I feel I have been unfair to Bryn skipping so many toddler groups, so we went to that first for an hour and then went to pick it up. We actually had no problems. It worked out quite nice. We got Avery from school and went home to start trying to get the computer set up. It was great because Bailey has dance class after school so we had a little extra time to get things set up. Wednesday was crazy as well. We were planning on having a Bailey sleepover on Friday, she wanted it to be an American Girl Camping theme party. Yeah, that is easy to accomplish when you are not in America!!! So, we had to get to the store to get the stuff for the party, plus I had to make a pecan pie for our Relief society Activity on Thursday night. We were doing a Thanksgiving theme, and they asked me to bring something American traditional. Since I really don't like Pumpkin Pie, and only stomach a piece of it on Thanksgiving, I thought I'm not going to go to the trouble of making a pie that I don't even want to eat. So, we went with pecan. We have imported pecans because we can't find them here and I couldn't find corn syrup. So, I used this vanilla syrup instead. I'm not sure the consistency was perfect but it tasted really good. I needed to get that done on Wednesday because Thursday was too full already. Wednesday after Girl Scouts, we picked Bailey up and went straight to the pizza place, Hallo Pizza, ordered our usual "Kentucky Pizza," went to the store across the street to get the pie stuff, went home and ate pizza. 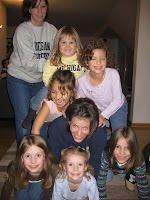 After which the girls were so good to get ready for bed early and watch a movie while I made the pie. It worked out great. Greg went to a US/Germany hockey game so he wasn't back until fairly late. 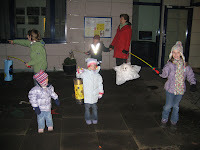 Thursday, we got the girls to school, and went to toddler group. I had to do my German homework at the toddler group because no other time presented itself. We left toddler group early to get over to the store to get the stuff for the party. We made it just in time to pick Avery up from school. We went home, ate lunch quickly, I had my German lesson, then it was time to pick Bailey up. We came home, had leftovers. The girls came with me to the Church so I could help set up. Bryn fell asleep on the way and actually transferred okay to the stroller so she stayed asleep while the other two watched Cinderella 3 in the Primary room, until Greg got there to pick them up. He got there in good time, so the girls were disappointed. Everything went pretty well. It was my first activity in German and a bit hard for me to understand. After, I was going to try to go to the book club, but I was so tired that I just came home and debated whether or not to start Baileys cake. I decided to wait until Friday morning, although I was planning on picking up our German driver's licenses on Friday morning. I decided to put off the driver license thing until Monday morning and get Bailey's party things finished. 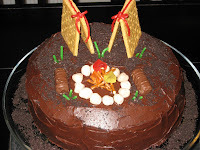 We just made a traditional chocolate cake with chocolate frosting and put ground oreos on top for dirt. Then we made tents out of graham crackers, a fire pit out of gum, pretzel sticks, and gummis for the flames. It turned out pretty cute I thought. 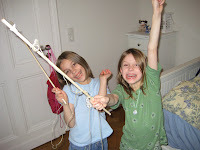 Next, Avery and I constructed fishing poles for the fishing game we had planned out of dowel rods, string and clothes pins. We found a bucket to put the catches into. Avery and borrowed some firewood from our landlords and made a pretend camp fire with wood, a lamp, and red, orange, and yellow tissue paper. We were all ready for the party which was happening at 5:00pm. We had chicken schnitzel and kohlrabi for dinner, which is a favorite amongst my girls. Greg got home just in time for the cake. 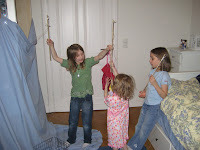 Then, we did the fishing, by setting up a blue sheet in front of Baileys closet and had the girls throw their lines into the sheet and when they felt a tug on their line, it was a mixture of crafty things, beads, these annoying sounding noise makers (which I regretted afterwards), magnetic clips, etc. I think they had a pretty good day catching "fish." We divided up the loot or "fish" and wrapped them in newspaper to take home. I let Bailey and her friend Olivia build a tent to sleep in which ended up being a good activity because it kept them busy for quite a while. 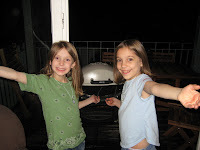 We roasted marshmallows on the grill and had s'mores before they went to bed. They chose a movie to watch in their tent, and went to bed but not to sleep until about 12:30. No, they didn't sleep in. That is the crazy part. They woke up at 7:00am. We had eggs and bacon for breakfast, and the girls played until it was time for Olivia to leave. I think the girls had a great time. I'm pretty sure Bailey felt it was worth the wait as her birthday was about a month earlier. Saturday, we had a normal (walk down to the market) morning. It was rainy and we did a few other errands. That afternoon, we had a birthday party to go to, but the only one who wanted to go was Avery. So, just Avery and I went. It was fun for us to have some alone time together. The baked goods at the party were amazing. She had a ducky cake, but then had apple cake, peach cupcakes, some other chocolate thing, mandel hornchen with marzipan, etc. She just kept getting more sweets out to serve. It was an incredible display. When we got home, Greg was having a video conference with his parents which led to him watching the U of M Wisconsin game through the computer to his parents TV. I know that sounds complicated, but anything to watch the game! I was really tired by this point and feeling slightly under the weather. Sunday morning, Greg went to Church by himself as the girls and I were all feeling a little sore throatish. What a week! Monday morning we got the girls off to school. My mom started to get all of her stuff together and get her things packed. 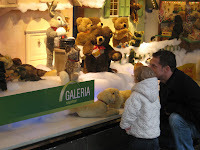 That afternoon, I had to meet my German teacher downtown Bonn to do his shopping. It was kind of a test of the vocabulary I had been learning so far. My mom and Avery and Bryn decided to come along. It was quite embarrassing at times. My mom wanted to get Avery a book at the book store so with about twenty people in line behind me, my German teacher said, "Great, can you get your mom's purchase gift wrapped." I felt so bad because there were people behind me rolling their eyes when I asked, but she was lighting quick with the gift wrapping. It turned out okay. I think I passed. 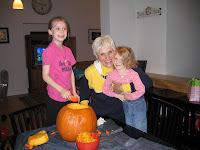 We got a pumpkin when we were in town so the girls carved it with my mom after Bailey got home from school. We had dinner and then my mom did this crazy mock Halloween thing for the girls. 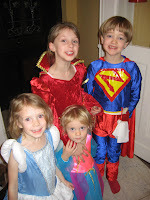 She brought costumes for them, put them on them, and then she went from door to door inside our house and waited for the girls to say trick or treat. She tried to look different at every door. It was quite humorous for the videographer, namely me. I am so glad I got some video footage of that. 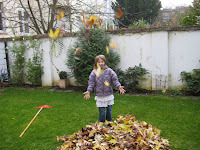 Tuesday morning, we dropped the girls off at school and I drove my mom to Dusseldorf to the airport. We fought through a ton of traffic to get there by 10:30am. I went home and started doing the laundry. Wednesday was Halloween. Bailey was allowed to dress up at school, but Avery had to wait until evening. 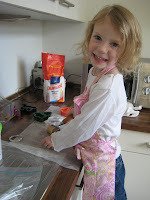 She helped me make the Halloween cookies for the party that night. 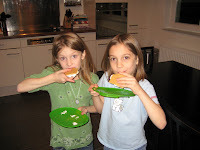 We went to another American family's house for a party that evening. It was quite nice. No trick-or-treating really happens here, although we did see a few people out walking home from the party. My mom brought Halloween costumes for them so Bailey was a queen, Avery was Cinderella, and Bryn was a princess of some sort. 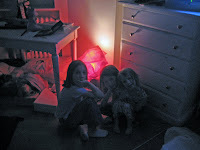 Here, the girls are with a friend from school. 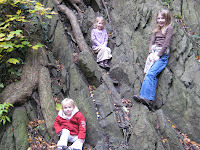 Thursday was All Saints Day, so the girls had both Thursday and Friday off of school. we had been debating all week whether we were going to go somewhere for the long weekend. We were very slow to get up and going on Thursday morning. 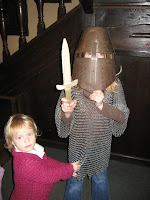 So, we decided to go to Sauerland and visit Burg Altena. The age of the castle is disputed. Two legends say 1000 or 1108, but the actual first record of it that we have is from 1122. However old it actually is, the town and the castle were very cool. 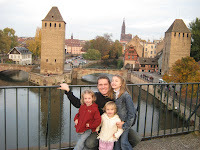 Friday, we were all up and ready to do something around 9:00am so we decided to go to Strasbourg for the weekend. Greg and I had been there before, but I had forgotten how charming the city really is. The weather forecast said it was supposed to be warmer than Germany so we were looking forward to not wearing coats. It wasn't quite that warm but at least it wasn't raining. Friday afternoon, we went to the Cathedral which is supposed to be one of the best examples of late Gothic Architecture, and holds one of the largest astronomical clocks. We walked around town for a while to see if we could find the boat launch. We had lunch at a place called Super Hamburger, it was quite good I must admit. 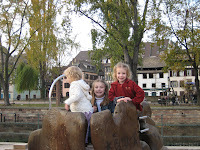 The girls found a playground that they begged us to stop at to play. Of course we gave in. I really feel like they have been very tolerant of our urging to go place after place and see thing after thing. Our hotel was a little ways out of the city so we could fit in one room. We grabbed some dinner and stopped at a grocery store to get milk for Bryn. We picked up some things for breakfast the next morning as well. That night was a nightmare. 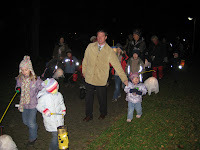 The kids were full of extra energy, I guess we didn't walk it out of them. They were jumping around, including Bryn who had just downed two sippy cups of milk. She really, really loves milk. then, she proceeded to throw it up on me. Why do kids never throw up on dad? we got her and me cleaned up and Greg put on a movie thinking that would calm them down. I don't know what they put in those super hamburgers but whatever it is, no thanks! They still didn't lay down and go to sleep for a long time. 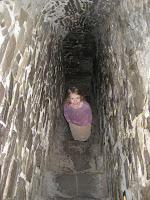 And, poor Bryn, she was just uncomfortable. I was afraid to give her more milk in case that was the cause of her stomach upset. But, in hindsight I think she just made herself motion sick from all the flips she was doing and in the night she was just hungry. I finally gave in early in the morning and opened a new carton of long life milk to give her a little. It made life easier for all of us. It was, however, another night of musical beds. At one point, Greg and I were in one twin with Bryn in between us while the other two sprawled out in the Queen bed. I think they are an acquired taste. 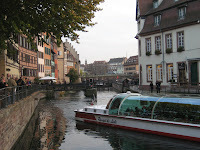 Never-the-less, our time in Strasbourg was nice. The weather was a bit warmer on Saturday which also helped. We thought about stopping in Heidelberg on the way home, but we thought that may be a little too much for this trip. Next time. We got home early evening, so we had some time to wind down before bedtime. It was a very nice week.